The 4th of July brought a three day weekend. Hmmm…what to do? A friday hike knocking of three more trail-less peaks. Yes. Yes, I think that is an excellent plan. As I expected the Elk Lake trailhead was packed. It doesn’t have much parking and fills up early. I thought arriving at 7:30am on Friday would be early enough – and certainly less packed than the following day – but nope it was already jammed pack. The first 3.4 miles is pretty easy – though quite wet. Starts mostly level, with some rises and falls, crosses several brooks (Big Sally Brook, Slide Brook, and more. 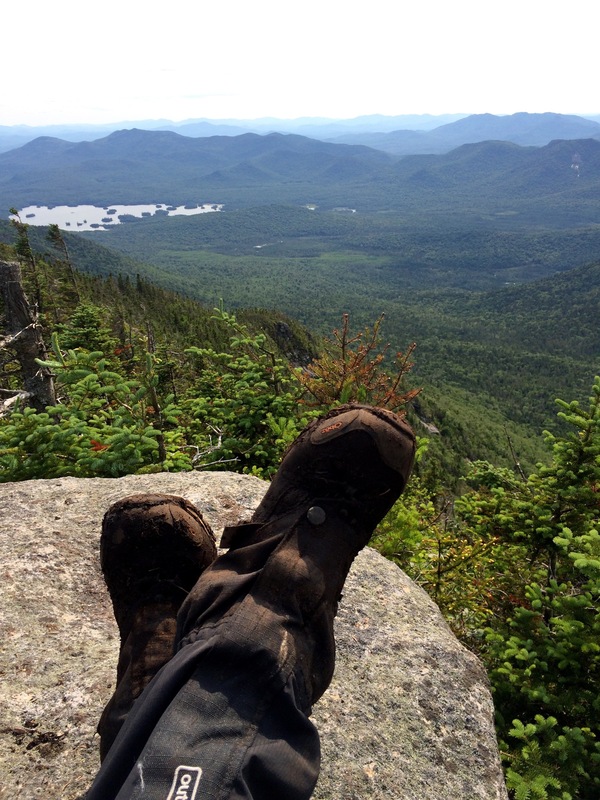 ), some easy grades, hardwood forest, hiking over rocks, muddy, narrow at times, rock footing – the usual with ADKs. Soon after after the Lillian Brook Lean-to (3.2 miles) the trail starts descending, crosses a small brook, and the split off to the un-maintained herd-path. It starts through a blowdown area that is muddy, slow and a bit claustrophobic. I couldn’t wait to get out of that section. Toward the end of the blowdown area the trail reaches the left bank of Lillian Brook. This section is the easiest of the day. Soft footing, pretty hardwood forest and only gentle grades but I was dragging. My energy felt like I was running on 80% and knew I was not keeping pace and I hadn’t even reached the hard part yet. I suspect burning the candle at both ends was finally catching up with me. The junction with the Hough (left) and the shortcut to South Dix (right) is where the elevation change gets real. Footing is easy and mostly on soft ground, with the occasional tree roots and rocks to climb up but no scrambles or bouldering. After climbing for a while it finally levels out and reaches a flat area with a junction that I chose wrong. I meant to do Hough Peak (left) first but headed to South Dix and Grace (right). Yep. Change of plans that is how it rolls sometimes. From the Hough junction the trail has moderate to steep grades, a few scrambles and reaching a bump with a nice viewing ledge, then descends and one final climb to reach South Dix summit. A nice, mostly open summit and while not 360 views was quite beautiful with Elk Lake and the mountains unfolding below. From South Dix to Grace Peak was a quick 45 min hike. Mostly on the ridge with some descents, muddy, muddy section, scrambles, ascents and a couple of last scrambles. An even better view and again on a mostly open summit. A quick break and even quicker pace back to South Dix – where I enjoyed it for a second time – now all by myself (just the way I like it). Now back to to the junction to Hough. The flat area is a bit confusing with some false trails so taking your sweet time to think it through is helpful. Knowing where I came from made it easy but seeing it a second time I’m not surprised I made a wrong slit-second decision. The climb to Hough it is straight forward. Increasingly steep (and steeper still) but with easy footing. There is a bit of a false summit when you reach some cliffs that you go around by following them to the left. It is little tricky being tight – brushing closely to the cliffs to your right and an ever decreasing trail with small trees that remain coming loose from the roots off the mountain to your left. At the cliffs you’re only about 15 minutes from the summit. It is a small summit but some great views. Even better that I didn’t see a soul while I enjoyed the last of the summits. 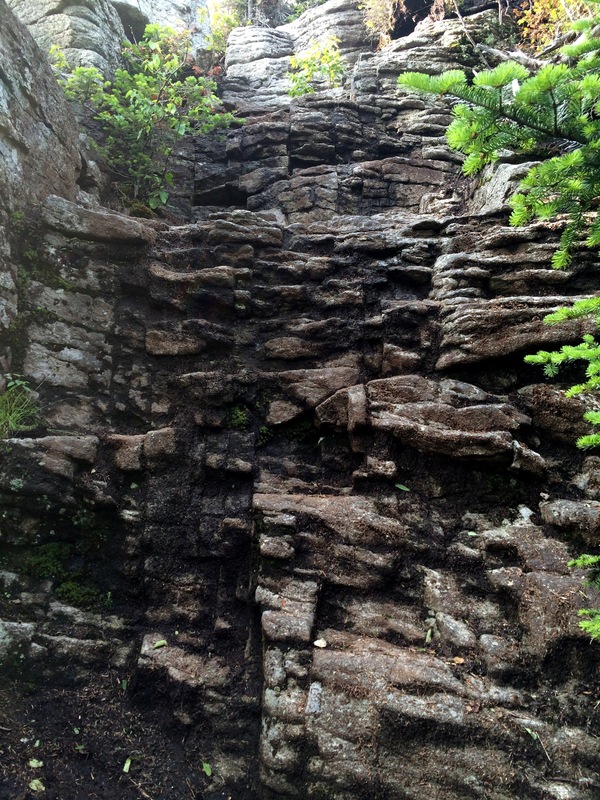 The ‘cliff’ I climbed down instead of avoiding. When I came back down from Hough I some how didn’t follow the trail to avoid the cliffs but ended up at the top. Rather than back tracking I just climbed down the front of them. No time like the present to build those ‘cliff’ climbing skills. From there going down flew by. While the elevation change was steep, the difference descending on easy footing (compared to scrambles or bouldering) is night and day. Once I was off the herdpath and back on the trail I was ready to be done and the number of people headed in was pretty constant. Not overly surprising given the holiday weekend. It was push of day – while not the most challenging – I was running on empty and somedays your body is off. Unfortunately that day was a three mountain, 4 summits, trail-less kinda day. Oh well. The Dix Range is done! And the name change from East Dix to Grace Peak is a great one. Renamed in honor of Grace Hudowalski, the long-time historian for the 46ers and the first woman to climb 46 High Peaks. I never got the opportunity to ‘write to Grace’ as my grandfather, uncles and old time 46ers did. But I’ve loved reading the letters from when my grandfather and uncles were working on their climbs in the 70s/80s. 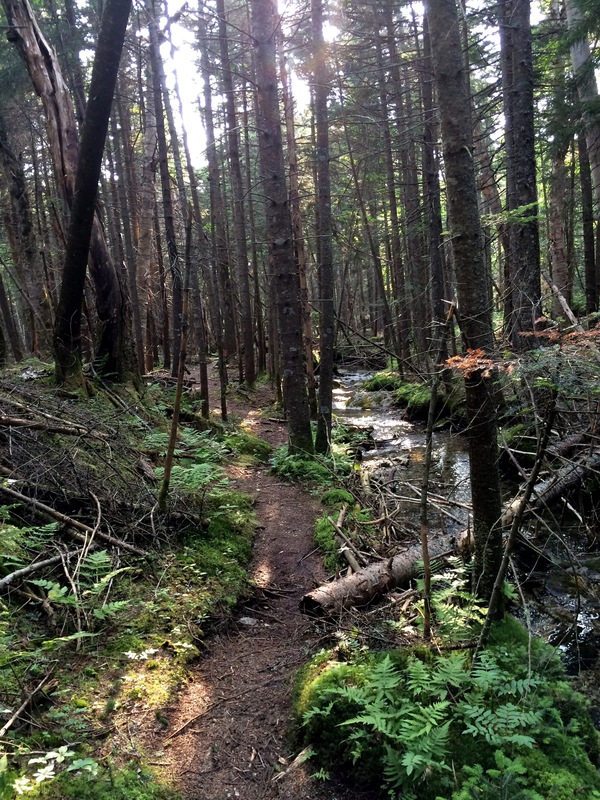 South Dix, Grace Peak and Hough: Completed 7/3/2015, total distance ~14.9 miles, time 12 hours, elevation gain ~3200. Trail split to Lillian Brook herdpath, South Dix and Hough. 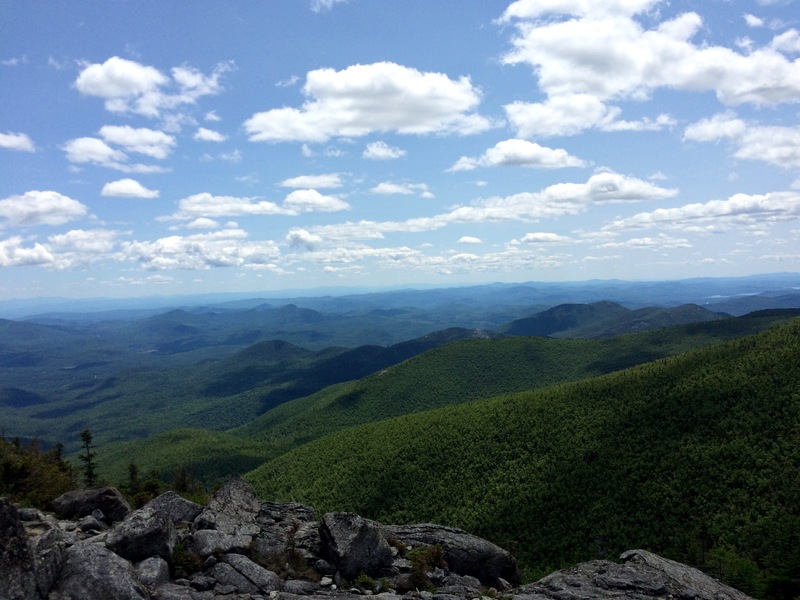 This entry was posted in Uncategorized and tagged Adirondack High Peaks, Adirondack Mountain Club, Adirondack Mountains, ADK46, Big Sally Brook, Dix Range, Dix Wilderness, Elk Lake, herd path, Hiking, keene valley, Lillian Brook, Slide Brook, Summit, Trail, trail-less. Bookmark the permalink.